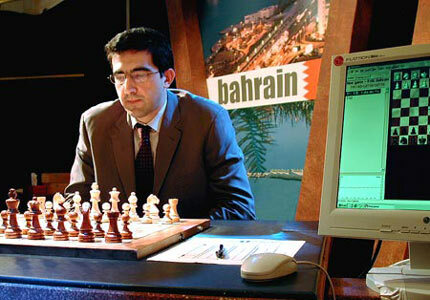 Billed as the revenge for the 1997 defeat of the then Chess world champion, Gary Kasparov, by IBM’s super-computer Deep Blue, the ‘Brains in Bahrain’ chess tournament has seen the reigning Einstein classical chess world champion, Vladimir Kramnik, battling with the world’s most powerful chess computer, Deep Fritz, for the pride of humanity and a prize of $1million. This long-awaited showdown was always predicted to be a closely fought contest but few of the many millions of people around the world who have followed the tournament, would have anticipated the scenario that the players face at 3pm local time tomorrow 19th of October. After seven grueling games, Kramnik and Deep Fritz are level on points with only one game to play. A few hours of play will answer the question of who, or what is superior, the creativity and ingenuity of the human mind or the sheer power of artificial intelligence. The event has captured the imagination, not only of the Chess World, but of a far wider audience, enthralled by the prospect of witnessing the ultimate battle between human intelligence and artificial intelligence. The Einstein TV reports, with commentary from British Grand Master, Dan King and with clips from a host of celebrity experts, have been taken by TV companies worldwide, from CNN to Reuters and from the main Russian TV station, NTV, to Associated Press Television News and the BBC. The internet site www.brainsinbahrain.com is being bombarded by 60,000-70,000 unique visitors each day, and the assembled press corps in Bahrain, have been filing their stories to the world’s press, from El Pais to International Herald Tribune to Le Monde, and news agencies globally. Other media, not at the event, phone into the media centre in Bahrain, daily, for updates to spread the word - from BBC Radio 4 to Time Magazine. To date, over 560 articles have been written about the event (following an internet search). Each move of each game is being closely followed by millions around the world, with excitement building as the deciding game approaches. Since the first match on the 4th of October, the tournament has provided spectators with a series of dramatic swings in fortune for Kramnik and Deep Fritz. After a tense and nervous draw in the first match, Kramnik proceeded to win games 2 and 3 with an awe- inspiring display that left the assembled GrandMasters of chess, to observe and commentate on the event, speechless in admiration. “He’s incredible” commented Nigel Short, UK Grandmaster, “He is playing perfect chess and has clearly prepared fully to face Deep Fritz.” As Kramnik, still only 27 years of age, established a two point lead over Deep Fritz, many commentators felt that he would totally dominate the computer and that it would be unnecessary to play all eight games. A draw in game 4 seemed to re-enforce the fact that Kramnik could easily handle Deep Fritz. Speaking ‘off the record’, the Kramnik team was cautious saying that they expected Deep Fritz to be stronger in the second half of the tournament. However, the odds on a Deep Fritz victory slipped to 50-1. In game 6 it was Kramnik’s turn to feel the pressure as the world’s most powerful chess computer, which can calculate over 3 million moves per second, outmanoeuvred the champion. Under severe time pressure and in a seemingly hopeless situation, Kramnik resigned the game to level the scores with two games to play. It was only in post-match analysis by Mig Greengard, one of the experts at the event, that it was revealed that Kramnik had resigned when a draw was possible. A flurry of excitement swept through the journalists, spectators and beyond. At the following game, an unusually stern-faced Kramnik dismiss the possibility of a draw in game 6, citing the time pressures he was under at that stage. “I have already forgotten about that game” he said, but admitted that his initial reaction on hearing the news was “unprintable”. Game 7 was as tense and nervous as Game 1, producing a draw and setting up a stunning finale to what has been an enthralling tournament. As both Kramnik and the Deep Fritz team prepare for the final game tomorrow, neither is prepared to make any predictions, claiming their opponent is the favourite. “Deep Fritz definitely has a psychological advantage. It feels no fear,” claims Kramnik. Mathias Feist of the Deep Fritz team was quick to counter that it is Kramnik who possesses more attacking options. Deep Fritz is currently a slight favourite amongst observers but most say the result is too close to call. Whatever happens, tomorrow will see the ultimate battle between Man and Machine, a chance for humans to take revenge for the 1997 humiliation or a perhaps final confirmation of the superiority of the machine. The game is just over, the report on any of the websites has not been posted yet. this program? It would seem so. Fritz Defends to Draw Game 8 and the Match! The Brains in Bahrain Man-Machine match is over and has finished in a 4-4 draw, with two wins each and four draws! Game 8 was the shortest game of the match, a 21-move draw. The World Champion was unable to make any progress against Fritz's solid defense. It was a tremendous result for Fritz, particularly after starting out with only half a point from the first three games. Both sides said they would be happy to play a rematch. Read more. Fritz - over the long haul ... only time will tell. immediately after the conclusion of the Bahrain match. Did the result match your expectations? What did you think the score would be? It was clear to me that the match was going to be very tough and equal. When I had a few days to see this new program I could see it was a really big improvement over the old one. I didn't know who was the favorite, nobody knew. Maybe people were making me the favorite because they wanted me to be. Are you happy with the quality of the games? I showed a good level of chess, especially in the first half of the match. But even in the games I lost I cannot say that I played badly. I made one mistake in each of those games, but only one, and that was enough. What did you think of Fritz's play? There were not so many games where it played strangely. In many games it was simply like playing a strong human Grandmaster, it was absolutely normal, absolutely human play. In game five Fritz played very well, better than any human. It seemed almost equal, but it managed to keeping putting on this pressure all the time, it kept finding these very precise moves, not giving me a chance to get away. I played that game really well, and I shouldn't have blundered, but the position was not so pleasant anyway. I must admit is simply played very well. What sort of preparation did you do for this match? Did you work on specific anti-computer strategies? In my preparation I tried to play this kind of anti-computer strategy, in some rapid training games. I could see clearly that it's not working anymore. The positional technique of this program is so much higher than years ago. It pushes pawns, builds the center, and begins activity on the flank. You cannot play like this anymore against computers. So many things I looked at in my preparations simply didn't work. I was shocked to see the level of positional improvement they had made. I didn't play training games, just positions. Maybe 20 moves so see how the computer played certain things, if it's doing well or not. It was very general checking. I can say that most of the openings we saw in this match I didn't prepare at all. It was a normal fight, I decided to play normal chess, not anti-computer chess. At the halfway point your second, Christopher Lutz, was critical of the Fritz team's preparation. What are your thoughts? The Fritz team made mistakes but they learned from their mistakes. They didn't know what to expect and they wanted to start in a very solid way, but maybe this wasn't the right strategy. What conclusions did you come to before and during the match about how you should play? I realized that it's possible to beat the computer in some types of endgames. It's hard to explain in words, but in very strategic endgames it's possible to outplay them. I managed it in the beginning, but then they realized it too and they switched. And they were very successful in the second half of the match, they had some good teamwork. I had serious problems in the second half, I wasn't getting the openings I wanted. But I expected this, I didn't expect to get eight excellent endgames. Is playing against computers good for your regular chess? How is it different? Playing computers can have a positive influence. My tactical feelings are very high after this match. You really see every little thing. I was managing a level of concentration that I could never manage before. Because you know that if you lose concentration for just one moment, it's over. One mistake and it's just over. For instance in game six, after Nxf7, I'm sure against most humans this would work very well. I couldn't say it was a mistake, but I realized afterwards that against a computer there is no way to save the game after that. You don't even realize it, but the game is already over! You are still playing, but the game is over! When I get back to human chess it will take some time to get used to it, it' s quite different. But it shouldn't take too long. And I know very well what I learned here. They have their good days, I have my good days. I just so happened that I had my good days at the beginning of the match. But I never thought it would be 7-1 or something like that. If you play your best you can win one, maybe two games. Maybe if you are playing great and have all the luck, one more, but not more than that. What do you say about that incredible sixth game, in which you sacrificed a piece but went on to lose against perfect defense? And then some analysis showed that you could have drawn against Fritz in the final position where you resigned. Objectively I think the final position of game six is losing, so I cannot say that I resigned in a drawn position. Maybe a computer won't find a way to win because it doesn't understand this fortress, but I cannot say I objectively missed a draw. But it was strange, because something happened that normally does not happen. It was a new experience. But to take on f7, to sacrifice a knight, well I thought, "let's have some fun, I'm in the lead." I'm pretty sure that at least this game six was very interesting for the public and it will be discussed for a long time so in this sense it leads to popularization of chess and this is nice. Maybe it was too much of a hard way to popularize chess for me, but what can you do?! Games two and three I think I played very well, there were several good moments and some very good chess played in the match. As for the last two games, I really didn't have much of a chance to do anything. The ChessBase team chose a very safe strategy in the final games. I couldn't even get a chance. Would you really have played the super-sharp Botvinnik against Fritz in game eight? I took a very deep breath in game eight, thinking about playing the Botvinnik against a computer. It was a moment quite similar to Nxf7 in game six, a certain challenge. But I figured, let's go and I closed my eyes and played Bg5 and prayed. I must say they prepared incredibly well. I don't know if it was luck or really very clever preparation, but they managed to use a very strange move order to get me into a position I hadn't seen before. It's very solid for black and they managed to get me into this position. It's a good position for white, and I would be very happy to have this position against any human. But against a computer, it doesn't care about your activity. It's a pity that I couldn't try a bit more, but it just happened like this. In the second half they were better in preparation. I wasn't getting the positions I wanted. You are one of the few people on the planet who knows what it is like to be 2800. Is Fritz really 2800? You can say Fritz is 2800, but you cannot measure it by numbers really. It's very strong, it's very very strong. But it depends on many things, especially the opening. In some positions, if it gets its positions you can make a draw or you can lose, two choices; you can never win. In some positions its 3000. Maybe you can suffer and make a draw. 10 Kasparovs and 20 Anands wouldn't help you in these positions. So on the average you can say 2800 or a bit more, but it matters what you get. If you get a position like what I had in game five then no human can fight it. But if you get what I had in game two then you have a chance. It very much depends on the opening stage. Now that it's over how do you feel about the result? I don't know how to assess the result. I cannot say I'm extremely happy with the result because I was leading 3-1. But I cannot say I am unhappy because after the match I know how difficult it was. Would it be different to play against a new program that is completely unknown to you? To create a strong chess program is like to create a strong human chessplayer. You need experience, it takes time. You need to lose games to learn how to improve. It's not realistic to expect a new program to suddenly arise, one that is as strong as Fritz. Click here to return to the main page for Kramnik vs. Deep Fritz.